There are a number of general and produce markets Melbourne has on offer. These are great if you are after a bargain, souvenirs, cheap 'designer' goods, fresh fruit and vegetables, meats, fish or European delicatessen. Many Melburnians do their meat, fish, deli and fruit & veggie shopping at these markets. You can get fresh produce, organic produce, European meats, much cheaper seafood, and Mediterranean delicatessen  as well as good coffee, entertainment and great atmosphere. In the general section you will find bargains: leather coats and bags, souvenirs, clothes, apparel, watches, ugg boots, toys, tools  perhaps not all authentic, but definitely cheap. 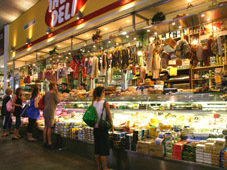 One of the most famous Melbourne markets, is the Queen Victoria Market. It is located in north end of the city along Victoria and Peel Streets. Get there by tram along Elizabeth Street. It trades every day, except Mondays and Wednesdays. 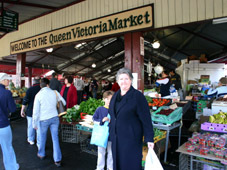 Here is more information on the Queen Victoria Markets Melbourne. Worth mentioning is the Queen Victoria wine market on weekends, and entertainment on Sundays. A Melbourne insiders tip is the Queen Vic night market, the first of the popular Night Markets in Melbourne. It operates from the end of November to the beginning of March on Wednesday nights, and is a place to be. It focuses on food, wine, music, art and craft and natural healing. The Prahran Market has similar opening times. Take the #72 tram and get off at stop 30. This is a popular life style market with quality fruit, vegetables, meats and delicatessen. As one of the large markets, it focuses on the family. It has an animal farm for the kids on Tuesdays, regular other childrens activities and a playground around its market place  a great place for parents to enjoy good coffee and gourmet treats. There is live jazz on Sunday afternoons. The South Melbourne Market is on the corners of York and Cecil Streets. Get there from Bourke Street in the city via the #96 tram. 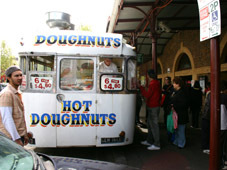 It is one of the oldest markets in Melbourne, established in the 1870s. You find old time marketers there with established stalls of fresh meats, fish, delicatessen, fruit and veggies, as well as bargain clothing, footwear, gifts, handicrafts. It is open Wednesdays, Fridays and on the weekend.